Happy Thank Your Mentor Day! January is National Mentoring Month, but today is particularly special because it is Thank Your Mentor Day! 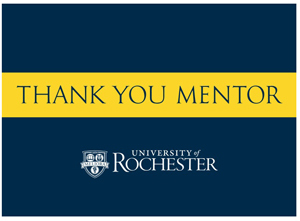 The University of Rochester’s Office for Faculty Development and Diversity has posted several ways for you to thank and honor your mentor. The site includes a printable thank you card, an e-thank you board for posting a special thanks to your mentor on the University’s website, videos from the UR community in 2011, information on the 2012 Mentoring Conference, and more. Check out the National Mentoring Month website for other ideas and more information about mentoring. We also strongly encourage you to comment on this post and share stories about a special mentor in your life, an experience you have had mentoring someone else, or any other anecdote that relates to mentoring. Because SBAI also strongly believes in the power of mentoring, we are holding several mentoring events during the 2011-2012 academic year. Yesterday was the third installment of the Failure is Impossible Mentoring Series. Debra Haring, Assistant Dean of Grants and Contracts, lead an informative session about grant writing for junior faculty and graduate students. Our fourth mentoring lunch will take place on May 9 and will focus on publishing for junior faculty. You can visit our website for more information. This entry was posted in Announcements, SBAI Events and tagged #Mentor. Bookmark the permalink.